Everyone can hear the knock Knock of Christmas. Everybody is ready to welcome this ultimate Fest. Are you? Yes !! and your business?? It’s the time to tie up your lace and tighten your belt because you have to start scuttling to increase your sales in this Festive Season.Do you know- 70% of people would like to receive offers on mobile devices, and 98% of Text Messages are read. If you want to reach door of each and every subscriber, then SMS marketing the best way to bell their door. Through it you can reach almost everyone or anyone. Nearly everyone has text-message enabled phone and everyone would love to know about your latest offer without even opening his computer, with just a click. Phones are like body parts these days. One can even imagine his life without any of his body part but without his phone. Am I crazy what I have said !! Today if you ask people that what is his most personal and precious thing is?-Yes!! His messages Of Course!! It is the most personal and effective way to get connected with your customers. 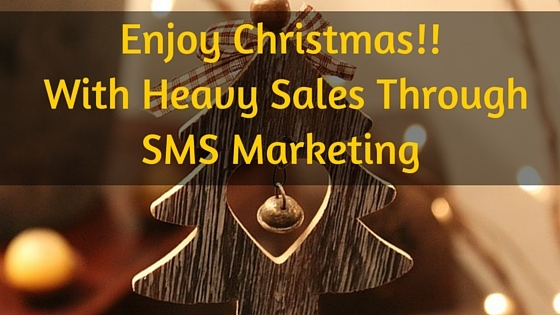 This year is almost over, but shopping isn’t, you need to do SMS marketing with these 8 steps and you will reach the destination of best sales achievement of this year. Start How will recipient benefit from your message? Examples was too good as according to blog SMS marketing is beneficial for business Only That is right also we can say apart From Business It is useful to share Social awareness regarding Any Upcoming Disaster , Alert For public etc. so For social welfare it is also useful term. SMS marketing is really useful because 100% public are not using smartphones so they cant use gmail and whats app , Text SMS is the easy route to share information with anyone.in normal mobiles Each n every common man can get the updates. You share a very good thought here. I am fully agree with you. Thanks for coming by and commenting here.